In early September, Sean, Andrew, Adam and I had the perfect window to attempt a trip we had planned a year before: backpacking the Armit River Canyon. Armit River is fed by the Porcupine Hills' largest waterbody, Armit Lake. Flowing north along the Saskatchewan-Manitoba border, the stream cut deep valleys through the escarpment regarded as canyons by those who explored them. 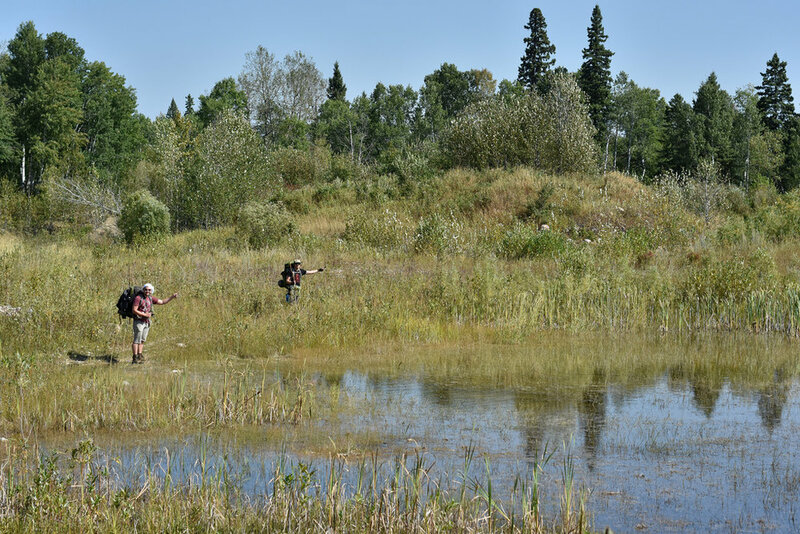 Armit River was not only topographically interesting, but ecologically important as a home for rare plant species and the most northern and isolated fescue meadows in Manitoba. The only problem for us was how to get there. Sean and I had spent hours poring over maps trying to strategize how to reach the canyon, which was roughly 20 kilometres upstream from where we would enter the river in Saskatchewan and hike across the border into Manitoba. Knowing that hiking the river would get us nowhere slowly, we searched for trails that could bypass the meanders and get us as far as possible. The path to Armit River Canyon was uncertain as the trails could easily be defunct, flooded or overgrown. All we could do was try and hope for the best. "Just hold it still," Sean said as he sawed back and forth. A fallen aspen was blocking the road, only metres away from where we would leave the vehicle for the next three days. Adam and Andrew took turns cutting through branches and clearing the road while I observed, pretending not to be completely useless. At least we were on the right side of the road block; I never thought to bring a saw. After removing the debris, we drove through and reached the end of the road where we packed and prepared for the longest hike we had ever faced. Sean took the navigator role for the trip and, according to him, we had to hike roughly three kilometres before we would even see water. There was a path straight south from us where we would eventually cut east through the bush and find the river. From there, we would walk upstream until finding another path Sean had located. My backpack felt light, there were few bugs and it was a refreshing change of scenery to be surrounded by quiet woods instead of running water. Tracks of hardened mud were spotted with animal prints, most of which I couldn't identify, except for the obvious black bear. At an indistinct juncture, Sean checked his maps and said it was time to head through the woods. Entering the forest was like walking into a greenhouse compared to the dry heat of open sunlight. It was lush and humid as we stepped through patches of waist-high ostrich ferns until reaching a large thicket of alder and maple. This was, as usual, a maze with no clear direction that rewarded passage with whips, scratches and hornet stings. Being a slow walker, I fell behind. I heard a rustling in the bush ahead, followed by the echo of Andrew yelling, "Are you okay?" But he wasn't talking to me. We found water, apparently. Sean had walked straight out of the bush, then fell down a dirt cliff into the stony riverbed. Other than a scraped knee, he was fine. The ground disappeared over the steep drop-off and I saw the river for the first time. Adam and I decided to find another way down. Once in the riverbed, I took off my backpack and got some much needed water. Even with a filter it was gritty to drink and somewhat unsatisfying. Sean said that it must be due to the rainstorm that hit the area the night before our arrival, so there was a chance it would clear up over the next few days. We marked the location with some trail tape, then proceeded to walk upstream. Stepping on invisible rocks beneath turbid water made our progress extremely slow compared to the trail and even bushwhacking the forest at times. Before the trip, I had read an article about indigenous trails that existed in the Porcupine and Pasquia Hills for over a thousand years. They were used for hunting and as a shortcut between major river systems, such as the Saskatchewan, Red Deer, Swan and Assiniboine Rivers, and led to camps in geographically distinct areas or spiritually charged places. However, their exact locations were unclear, and I assumed most had either been converted to roads or were virtually unrecognizable. Not long after we started hiking the river, Sean directed us back into the woods on the east side of the valley. The next trail was only a few metres in just like he said it would be, but we were still several kilometres away from being remotely near the canyon. We hiked for what felt like a long time on that trail, climbing higher into the hills. There were subtle changes in the forest that caught my eye, particularly the dominance of large stands of old-growth spruce and balsam fir. When we got another glimpse of the river, I couldn't believe it was still Armit; it was shallow, narrow and crystal-clear. I didn't think it could change so drastically in only a few hours. While the river improved, the trail did not. It was becoming overgrown and degraded by wash-outs and fallen trees. The group was silent and focused on getting as far as possible. Sean unknowingly crossed paths with two moose, cow and calf, which huffed loud and deep in our direction before trotting off into the woods. By mid-afternoon we crossed the border into Manitoba and the trail broke away into a large cutblock. 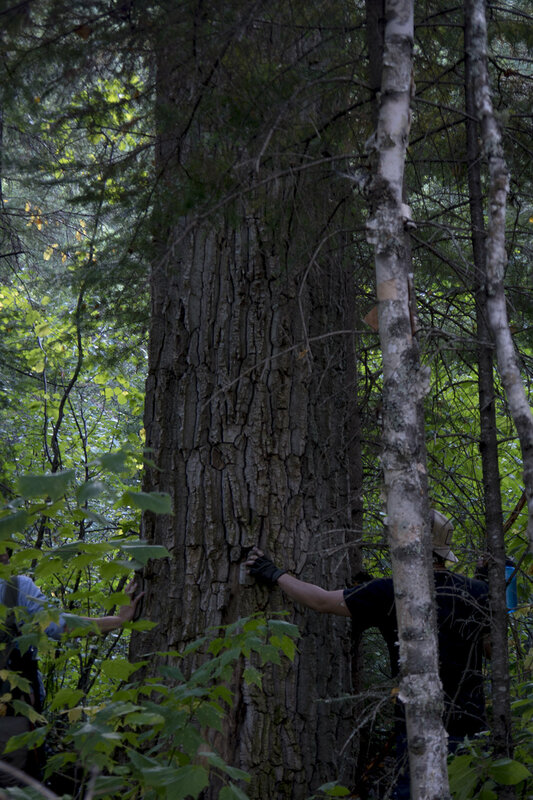 There was no forest canopy, only stubby brush and a few standing but long-dead tree trunks. We managed to spot an opening in the woods where the trail was likely to continue. We needed to take advantage of the easy hiking, but even through forest the path was becoming poorly defined. 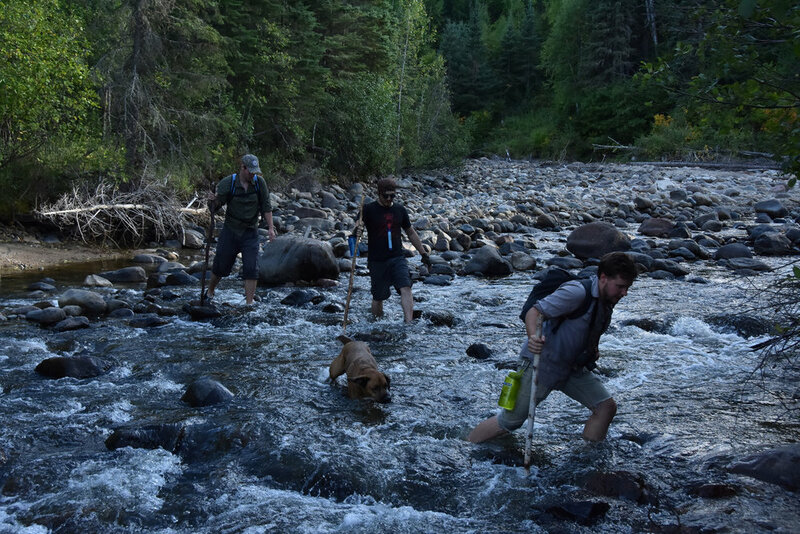 Most of us wanted to keep hiking until dusk, while Sean reluctantly agreed after spotting an entry point to the river where we could have searched for a place to camp. The sun was past the treeline and making it difficult to judge how much useful light we had left. Then, the trail split into two directions: one veered into thick bush that was virtually impassable, the other went up a steep hill that was washed-out by floods and littered with wood debris. Sean checked his GPS, and for the first time he wasn't sure where we should go. We decided to take the hill, but made it only halfway up before running out of breath and collapsing in a pit. We were moving farther away from the river and wondered if the trail was leading us in the wrong direction. Andrew offered to scout ahead and see if it was worth continuing, while Adam, Sean and I discussed another issue: whether we would have multiple campsites over the next three nights or just one. Andrew returned and said the trail was completely flooded, but there was something we should see. There was a plateau on the hill where a multi-level complex of beaver dams and ponds was built. While not much to look at from ground-level, it was a bizarre sight with large, still ponds descending into the forest like a giant staircase. I crossed the dam on the upper level to see if it was promising, but it seemed to continue out of the valley. We were running out of time to take chances on mysterious trails. The sun was about to set and we had reached our limit of exhaustion. We agreed to backtrack to where the trail was close to the river and start looking for a place to camp. Through the bush, we reached an opening in the woods where we could see upstream. The perfect campsite was only a few metres away. It was a high, flat beach with access to water and a sheltered patch of spruce trees if the wind or rain kicked up. The forest coughed us up onto the riverbed of gravel and sand, where I peeled my backpack off like a shoe stuck to a bathroom floor. According to Sean's GPS, we had hiked roughly 12 kilometres and climbed an elevation of over 1,500 feet. I felt completely weightless and floated around the beach like a marionette. After setting up tents, we decided that it would be our only site for the trip. We needed an extra night to make multiple camps practical and not be in a rush to get home, so we would attempt to reach the canyon the following day, by river, without trail. When I finally slunked out of my tent, I was not as sore as I imagined. The morning was bright and sunny and the cards appeared to be playing in our favour again. The rest of the group came alive and joined me for breakfast shortly before starting our off-trail journey upriver. It seemed unlikely that we would make it to the canyon, while the fescue meadows were still impossibly out of reach. We agreed to simply enjoy the hike, keep a moderate pace and see what we find. I immediately began snapping photos. Something about everyone walking upstream together seemed quaintly spiritual, like a postcard in a Mormon giftshop. "It feels as if we're walking toward something important," Andrew said. "Like we have information to return to the Federation, or we're returning an artifact to the fire—you know, from what once it came." Stepping through crystal-clear water with my forest staff, I was already sold on the fantasy. Armit River was too perfect not to have magical qualities. "We do have a mission," Adam said. "I can't go back to school with this mullet—you guys gotta cut it off." Adam had grown quite the squirrel pelt over summer, so giving him a haircut seemed like a worthy quest for wizards, spacemen, or whatever. We just needed to find the ultimate wilderness barber shop. We carried forward with purpose, however lofty, when the perfect side-quest revealed itself; small waterfalls were bursting from the forest-covered riverbanks, which was a sight strikingly familiar to what we found a year ago at the Pasquia River. We decided to investigate. Unlike Pasquia River, the flooding wasn't caused by a landslide, but by a beaver that constructed its own mangrove-like paradise. The trees inside the forest were still alive, which led us to believe the dam was new. This wasn't the first time we hiked through a flooded forest and something about sloshing slowly through a shimmering, reflection of the forest felt like a living dream. After spending a long time wandering in ankle-deep questionable beaver water, we exited the pool and continued upriver. We were making mediocre progress compared to the previous day, even without the burden of heavy backpacks. I would blame untrustworthy rocks, but I would sooner blame Adam and Andrew who stopped to examine every plant, rock and tree we crossed. It was easy to forgive them, though. The river was fascinating. Sean remarked how Armit was a shapeshifter. It took on the character of other rivers we had visited in entirely different areas of the Manitoba Escarpment. Rocks protruding shallow, clear, rusty water surrounded by mixed wood forest reminded me of Pine River in Duck Mountain, while vast flood plains scattered with boulders, enclosed by eroded valley walls were the signature of Rice River in Pasquia Hills. Armit had sections that would have fooled me into believing it was either of these streams. It was also turning out to be one of the most peaceful and beautiful rivers we had ever explored. Sean checked his GPS again and was surprised to find that we were getting closer to the canyon than we thought. It was already mid-afternoon, but we were excited to move forward. The hike back to camp would be quicker anyway. When we stopped for more than a few seconds, Sean's dog Jean-Paul would lie down almost immediately. This was always a sign when our hikes went on a bit too long. Andrew, who had become quiet and lighteheaded, admitted that he was becoming less sure-footed—a dangerous state to be in when hopping on slippery rocks miles from nowhere. Adam, on the other hand, was still wanting to get to the canyon. He convinced us to keep going. After all, we needed to cap off the hike with something. We were just about to cut through the forest to bypass another bend when we saw our capstone. It was a river wall so monumentally large, it had to be the mouth of the canyon. Of course, there was no other option but to climb and check out the view. Getting to the top of the wall was harder than it looked. Aside from feeling as if the ground could give way and slide into the rocky riverbed, it was too steep to climb in many places. I hoisted myself up, using rocks and feeble young tree trunks as footing. At the top, I crawled to the end of the ridge. Not being one for heights, this was mildly nauseating. There were four of us kneeled on an overhang held together by nothing but sod and tree roots. Back at the bottom of the river, we decided that this was as far as we would make it into the canyon. "I suppose this as good of place as any," Adam said. "Get the scissors." We didn't have proper shears, but we were able to cut off Adam's mullet with a dull Buck knife and multitool, then later touched-up with a pair of first aid kit scissors until he had a haircut that was respectable. "How does it look?" Adam asked. Andrew folded in his knife. "Terrible," he said. We spent the rest of the afternoon in the shade of the canyon unaware that our sunlight was disappearing. Once we began the hike back to camp, it was apparent we had gone much further than we thought and would need to move hastily. But even with the darkness setting in, it was hard not get caught up in the beauty of Armit River, the massive trees and cascading waters. We made it back to camp just before dark. The only thing out of order was Adam's tent, which the wind had blown over and was teetering on the edge of the river. The distance we were able to cover over the entire trip was a new milestone, a total of nearly 30 kilometres in a place we knew little about. This alone was enough to make Armit one of the most successful trips we had ever accomplished. There was something else undeniably special about Armit River. It captured the awe I felt when we first started backpacking streams in the Manitoba Escarpment—when the hills had mystery and I was less concerned with using the right words and photos to describe them. While paths might help us discover more of the hills' secrets, I left Armit feeling inspired by the fact that, no matter how hard we tried, we would never find them all.